High Quality Content by WIKIPEDIA articles! 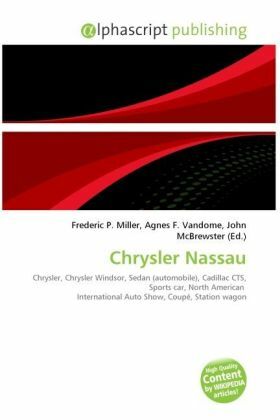 Nassau is the name used by several vehicles made by Chrysler. The name was first used as a trim level in the mid-1950s, denoting the high-line coupe of the Chrysler Windsor series. More recently, two concepts by the manufacturer bear the Nassau nameplate. The first Chrysler Nassau concept was a styling exercise penned in 2000 by Chrysler designer Robert Hubbach. The resulting vehicle became a working model used by engineers and stylists to eventually create the 300 sedan, introduced in 2005. As with many recent models from Chrysler, very few exterior details were lost in the translation from concept car to production vehicle. One notable exterior difference between the Nassau and 300 are taillamps that wrap over the rear fenders, similar to the treatment on Cadillac CTS sport sedan. The 2000 Nassau styling mule is currently housed in the Walter P. Chrysler Museum.